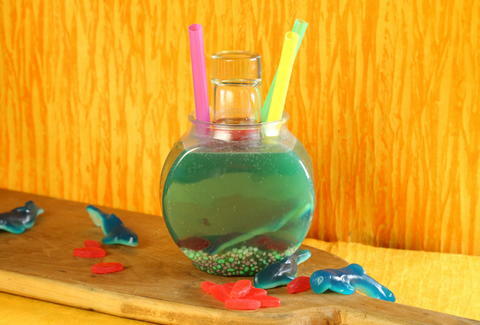 Grab your friends and belly up to this fish bowl cocktail inspired by Just A Pinch. Swedish Fish swim around in vodka, coconut rum, peach schnapps, and Blue Curaçao, and a bloody grenadine blood shark attack happens when you lift the shot glass. This cocktail is a catch for sure. Pour in 6 oz. of vodka, 6 oz. of coconut rum, 4 oz. of peach schnapps, 1.5 oz. of blue curacao, and fill the rest with sprite. When you’re ready pull the skinny glass filled with grenadine slowly upwards to release the “blood,” or the grenadine and vodka mixture, and enjoy!